My Littlest Lady R is very physical. A stark contrast to her big sister and a steep learning curve for me. I don’t know if it is the influence of seeing a 4 year old day in day out doing things she wishes she could do or it would always just have been her nature. However she sure is in a hurry to rush through life. At 5 months old she crawled, this was a strange concept to me, took me completely by surprise and made me re-evaluate how to parent a moving 5 month old! Not content with this, she started pulling herself up by 6 months and the week she turned 9 months old she took her first steps. You have not been able to stop her since. This little lady loves to walk. 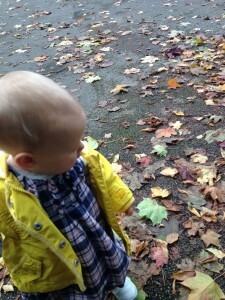 Every day we are out and about even if just on the school run. She will walk anywhere and everywhere she can, not particularly happy to be restrained! She is fearless and not even objects or people seem to get in her way; whether that be in the street, to school, the playground or in the supermarket. When we bought her these boots she first walked like she had been put in casts – but that didn’t stop her for long. 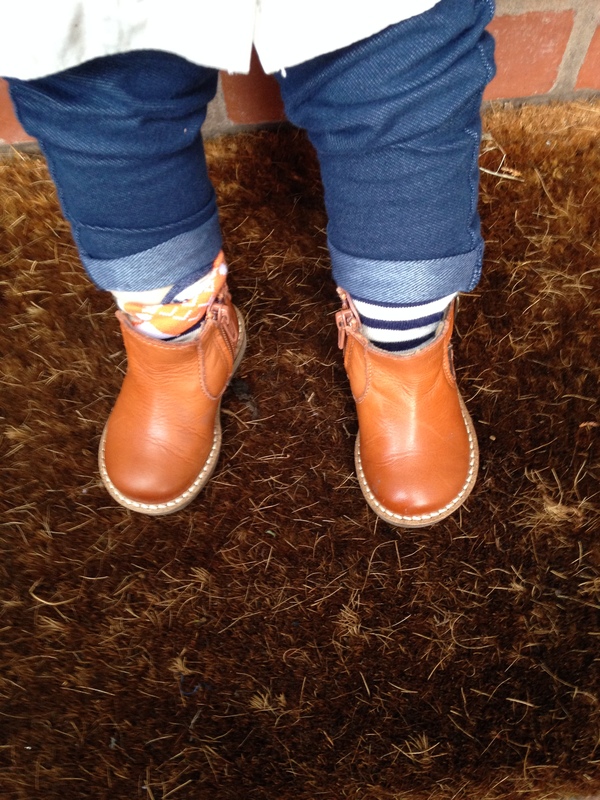 These tiny feet and tiny toes – in tiny shoes…. She attracts a lot of attention at the moment and I get asked frequently how old she is and that she is very sturdy and confident for so little. 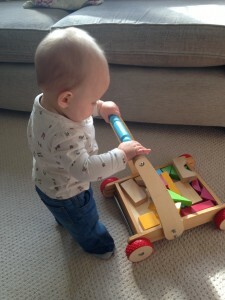 Of course they are totally right and I am proud of her – but it does mean the baby days didn’t seem to last very long; I feel like I have a fully fledged toddler already and she isn’t even one yet. 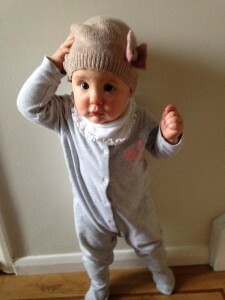 I did think that maybe as this is our last baby she might stay a baby for a wee bit longer than this, just maybe. It does also mean that capturing a photo or a moment with her is a challenge in itself. But she is R, and really, I couldn’t imagine her any other way. As always Mama is super proud of you. Keep being you – but please stop every now and again and look for me…….Mama loves you. Next Post My Heart in her Hand. 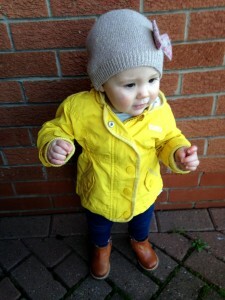 How cute are those boots, and I love her hat! 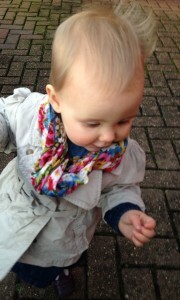 I know what you mean about savouring the baby days, I am trying to do the same, but they go so fast!